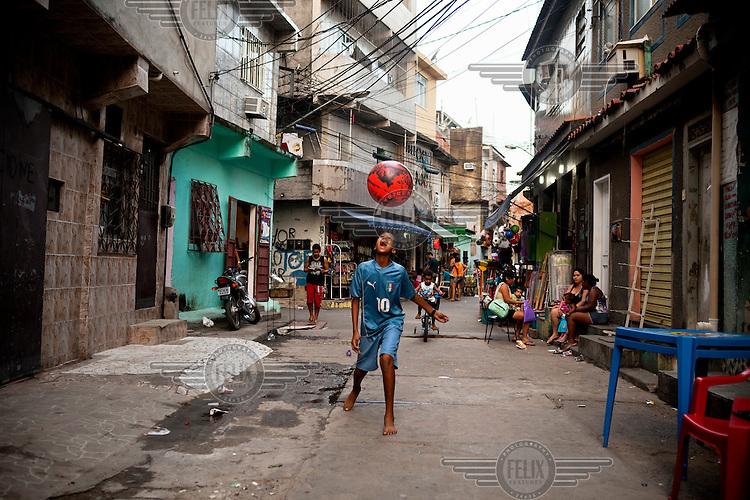 A boy plays with a ball in Complexo da Mare. The favela consists of a complex of 16 communities, in the north zone of Rio de Janeiro. It is the largest complex of favelas, housing 130,000 residents. It is targeted for pacification as the city prepares for the 2014 World Cup and the 2016 Olympics. Four factions run the complex, three drug gangs and the militia. The rival gangs fight for control of the drug trade. Although crime is low in the favelas by rule of law enforced by the gangs, cross-fire shootings and gang violence is often high. Neighborhood associations are an integral part of community development within Mare, making up for a lack of government assistance.